Property Details: 1 Bedroom, 1 Bathroom Vacation Rental, sleeps up to 4. Hawaii condo, beach resort home in Waikiki. This gorgeous, bright and airy, 1bd/1bth oceanfront, ocean/lagoon view unit, located in the iconic Ilikai Hotel and condominiums was completely remodeled into a chic, luxurious, Hawaiian 5-star retreat! This amazing suite has a beautiful, modern, tropical decor with exotic import furnishings throughout. High end materials, including a fully-equipped, custom gourmet kitchen, with modern white cabinets, sleek quartz countertops, marble backsplash, stainless steel appliances and an expansive kitchen countertop that comfortably seats four. Perfect for entertaining or casual dining! Spa like bathroom, with imported travertine tiles along all of the shower walls and floors. Stunning wood look flooring throughout the rest of the suite, highlighted by recessed lighting, with dimmer switches above the kitchen countertop and living room area. Enjoy front row seats of the Friday night fireworks and of the Hilton evening Luau Show from your private, spacious (120 sq. ft., with imported Travertine flooring) lanai. Gaze into the glistening pacific ocean as you sip on a glass of wine. Sit back, relax and take in the ocean breeze. Yes, you're in Paradise! 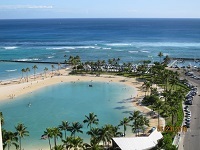 Ilikai Hotel Condo Rental in the Islands of Hawaii. Visit the Hawaiian Islands and Waikiki-Honolulu - home to some of Hawaii’s most historic places, such as Iolani Palace, the Kawaiahao Church, the Hawaiian Mission Houses Historic Site and Archive and the treasured artifacts of the Bishop Museum to iconic landmarks like the Aloha Tower, the King Kamehameha I Statue, the Duke Kahanamoku Statue and the historic Hawaii Theatre. Honolulu is also Hawaii’s hot spot for arts, culture and entertainment. From the nightlife, live entertainment and fine dining of Waikiki to the art galleries and underground bars of the Chinatown arts district. Waikiki, in Honolulu on the Hawaiian Island of Oahu, is among the most visited places in the world. Whether you’re looking for Hawaii’s finest museums, or Hawaii’s finest Hawaii Regional Cuisine chefs, the best resorts, festivals, and events, or just some fun things to do, you’ll find it all in Honolulu - come experience the magic of Hawaii.